Introduction – initial opening screen. 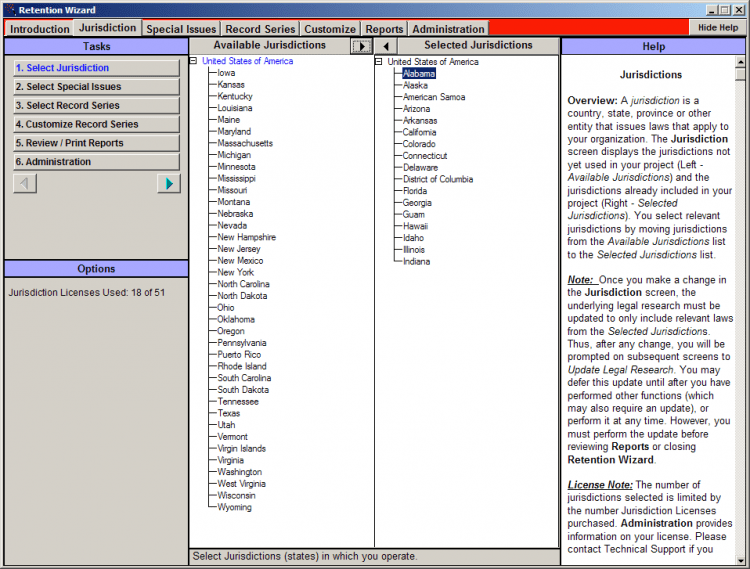 Jurisdiction – select states for your schedule. Federal is selected by default with the ability to add additional states. One state selection is included with the option to purchase additional state selections. Special Issues – to restrict the scope of legal research to selected states in the areas of Offices/Employees and Accounting/Taxes. Record Series – build your retention schedule by selecting applicable record series. Customize – change the text, codes and retention periods of your selected record series. 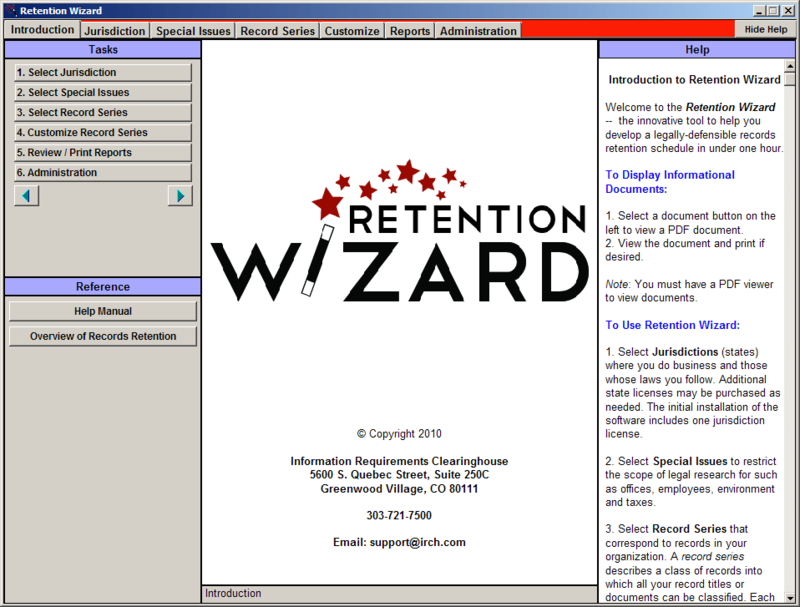 Reports – various reports for documenting and distributing your retention schedule through print and/or PDF distribution. Administration – Wizard information and options. Tasks – alternate method for accessing various Wizard functions. 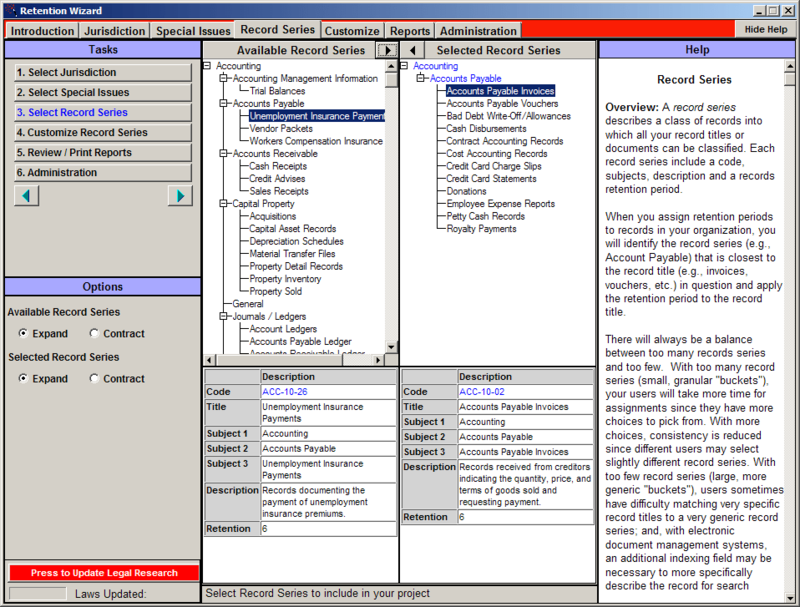 Reference – documentation for the Wizard and an overview of records retention in general. This becomes an Options section on the other function tabs. 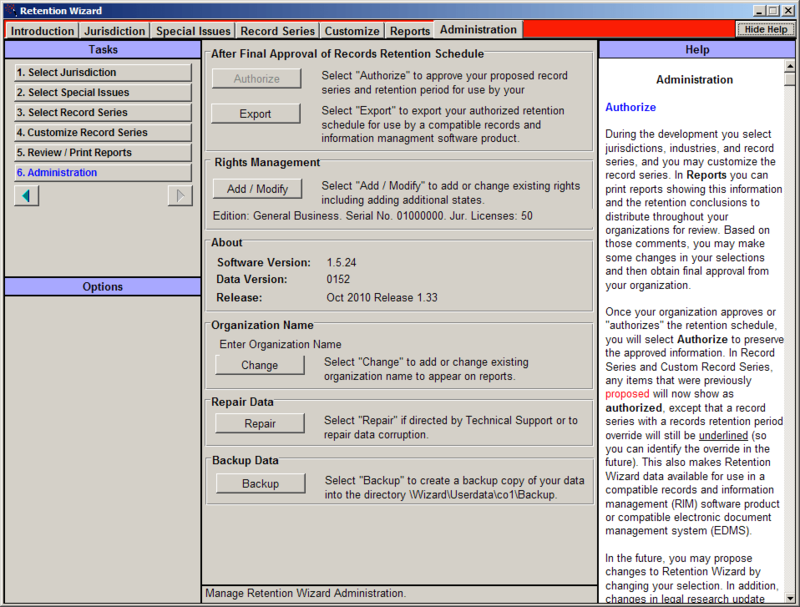 Main Window – this center window is where you will develop the majority of your schedule through selection and editing. Help – displays context-sensitive help and suggestions. The Jurisdiction tab is for selecting states in which you do business. Selecting a state incorporates the research of that state in your retention schedule. The retention period is based on the selected federal and state jurisdictions. The Wizard includes one jurisdiction license for one state selection. Additional jurisdiction licenses can be purchased. 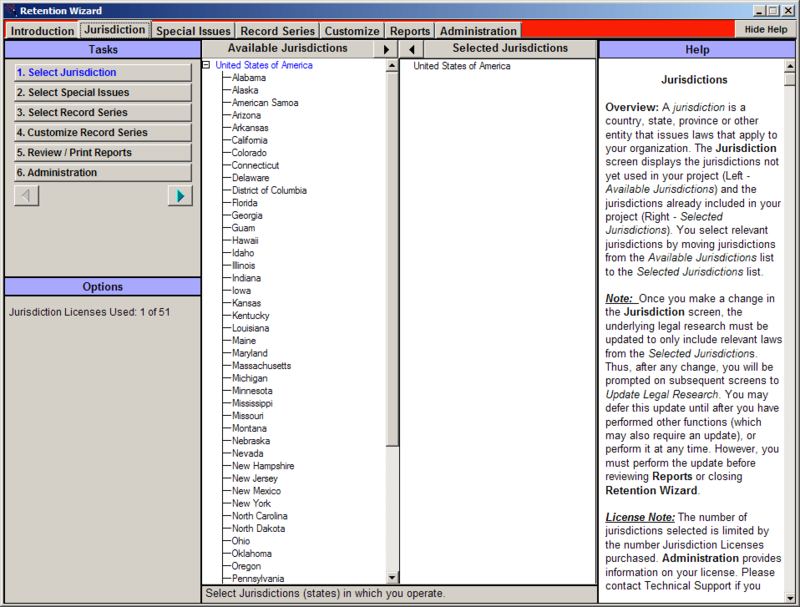 This Jurisdiction tab screen shows how jurisdictions/states are selected by highlighting selected states and using the arrows at the top of the window to move highlighted states between the selected and available columns. The Special Issues tab allows you to restrict the scope of legal research for selected states in the areas of Office/Employees and Accounting/Taxes. Select the “Offices / Employee” options to restrict certain laws to states where you have offices or employees. For example, if you only have offices in Colorado, California and New York (plus United States Federal) you may not want to consider employment law for other states, even though you may do business in those other states. Similarly, select “Accounting / Taxes” to restrict the laws related to account or taxes to just those states where you pay taxes. The Record Series tab is for selecting record series for your retention schedule. Each record series can be customized in the next section. 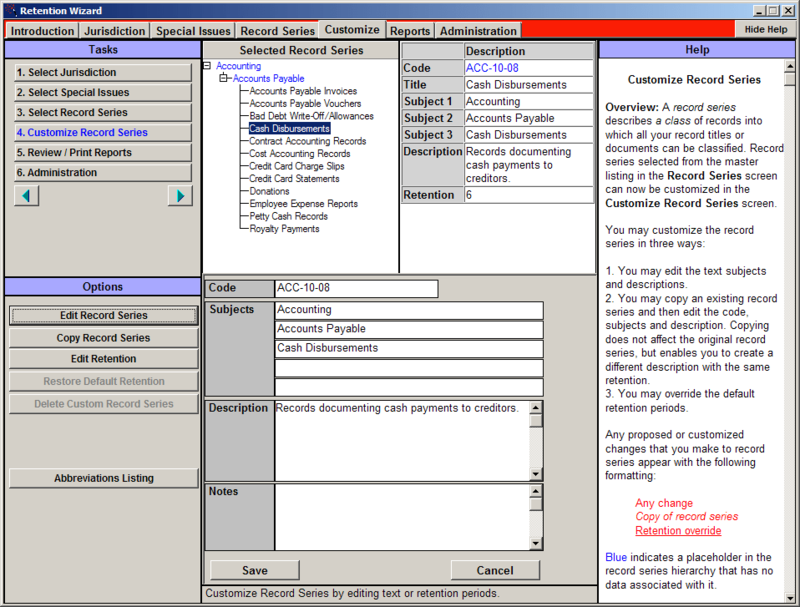 The Customize tab enables you to modify the code, subjects and text of your selected records. On the Customize tab, the retention periods for your selected record series can also be modified. The Reports tab provides the necessary documentation for your retention schedule. Various reports include coding, descriptions and retention periods for each selected record series to all citation references that serve as the legal foundation for your schedule. 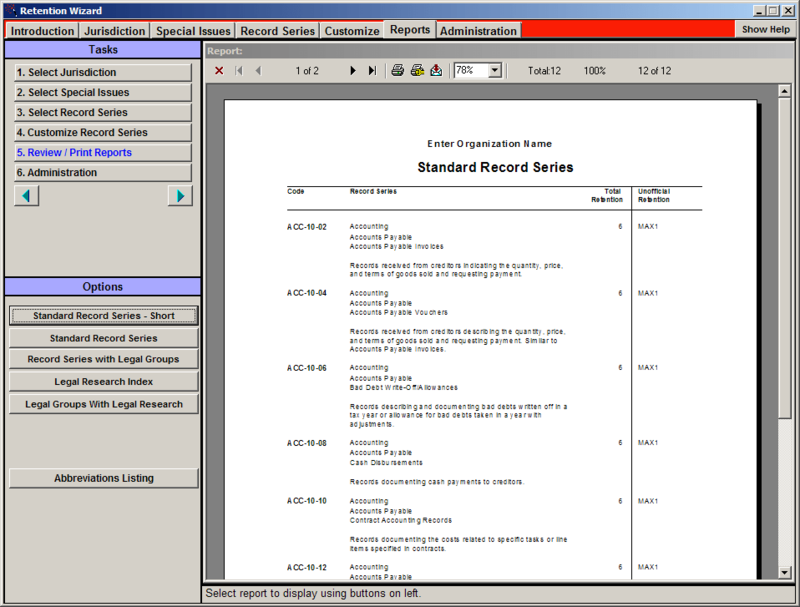 Reports can be distributed through printing or exported to PDF, Word, Excel, and various database files. After Final Approval of Records Retention Schedule – official retention periods are current or authorized appearing in black. When record series retention periods are customized, they are listed in red for review and approval. The Authorize function incorporates all customized modifications replacing the current retention period. Rights Management – program codes obtaining from IRCH are entered change program editions or add program features such as additional states. About – display version information about the data base, program files and release date. These change when the program is updated. Organization Name – input the company or organization name which will appear on reports. Repair Data – run this if there are data problems such as records not displaying correctly or if instructed by IRCH Technical Support. Backup Data – makes a local copy of the user data files. This does not replace a regular backup routine of the Userdata directory which contains all retention schedule information. The webinar was great. I am hoping you might repeat it sometime in the future.